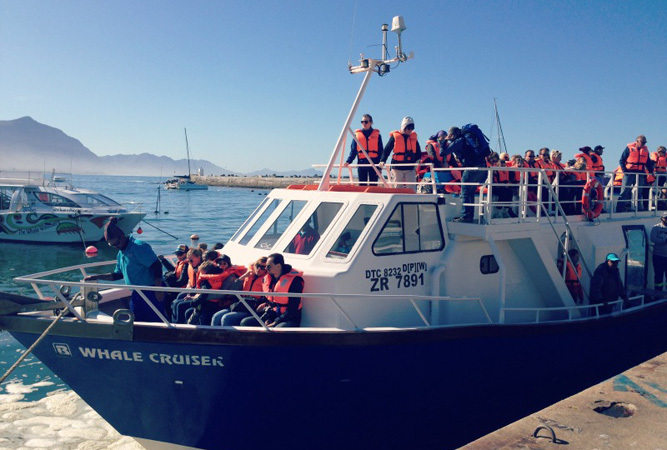 Only an hour and a half’s drive from Cape Town, Hermanus hugs Walker Bay every bit like a mother who has perfected the art of the embrace – gently, but without any attachment – so that its waters appeal to a group of whales who return, year-upon-year, to mate and calve in these waters. Being animals they’re unperturbed by ideas anyone on land has about their presence in these waters, and so they keep largely offshore until it suits them – usually around September – to coincide with the annual Whale Festival. 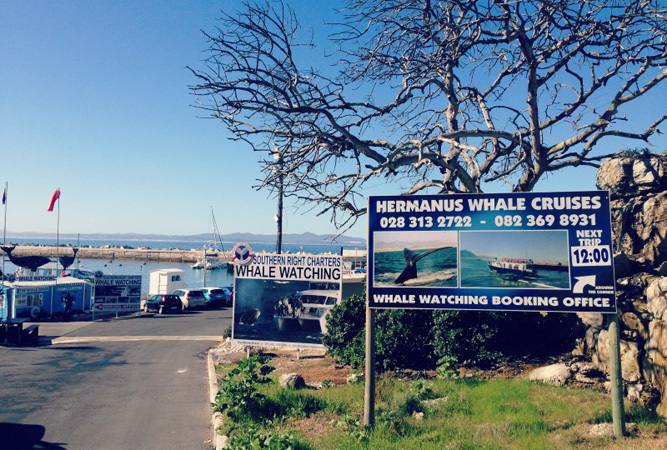 The New Harbour (as opposed to the Old Harbour, the remains of which lie at the heart of Gearings Point below cliffs that function as some of the best land-based whale watching in the world) is whale watching central as boat-based charters come and go with amazing regularity. Our advice: If you want a guarantee that the whales are in the bay, go in September at the same time as the Whale Festival. But expect crowds and a lot of loud entertainment on the cliff tops close to town. 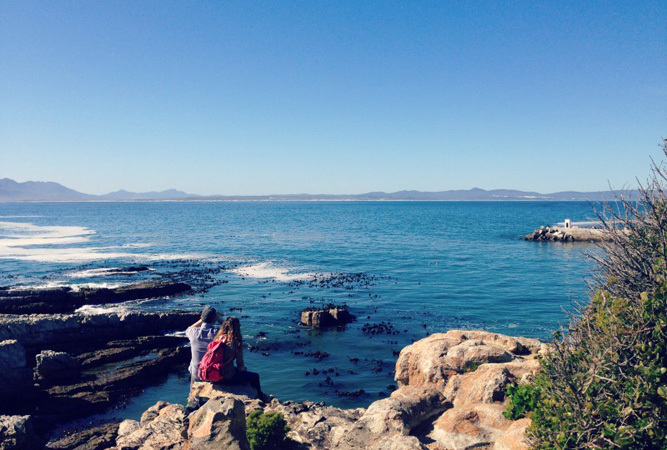 Hermanus’ Cliff Path extends 11 km between the New Harbour in the west and the Klein River Estuary in the east, just beyond Grotto Beach. The entire section, wedged between the Kleinriviersberg mountains and Walker Bay, is nature reserve – conserving fynbos and a fragile ecosystem within its boundaries. 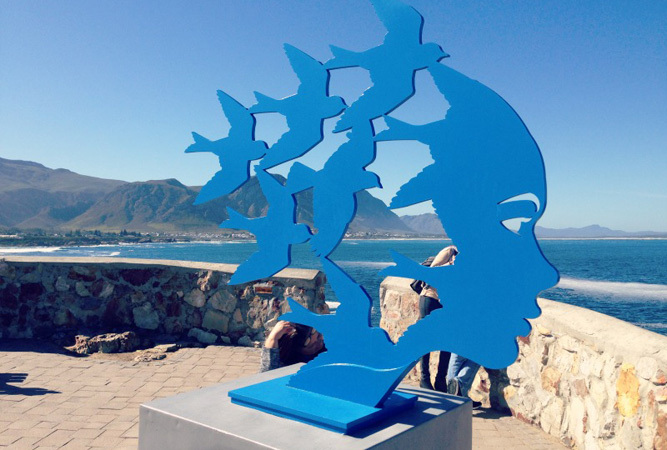 Around the 3.5 km mark is Hermanus Village Square, with a series of restaurants overlooking a roundabout, and children’s play park. The entire Cliff Path is gravel along which are benches overlooking the most beautiful vantage points to allow you to sit and watch for whales at any time. The path is broken only at one point, around the historic Wendy’s House. This cliff path provides some of the best landbased whale watching in the world. 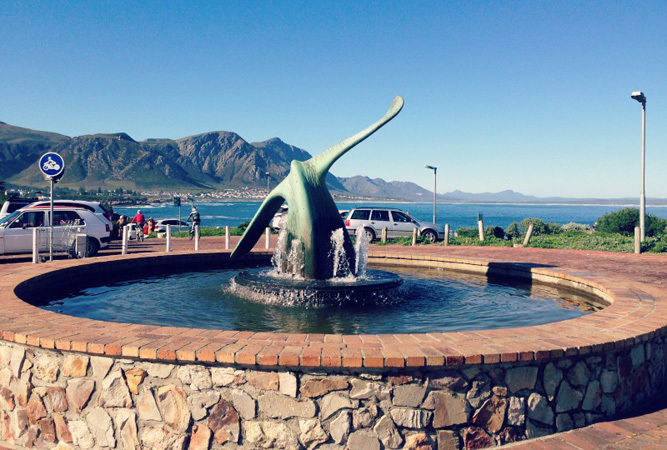 The best viewing sites are: from Gearings Point in Hermanus village to Roman Rock, from Mickey to Kraal Rock, at Sievers Punt and at Kwaaiwater. We recommend: We parked at the New Harbour where you’re more likely to find parking, walked to the village, had lunch, explored, and then returned back along the path – a good 7 km walk that was not at all difficult. Fick’s Pool is just over halfway between the New Harbour and the Old Harbour where there is a grassy area and a bench perfectly placed to overlook the pool. It’s dassie-central when the fynbos bushes come into bloom because, believe it or not, dassies eat flowers. In fact they’re pretty nifty bush climbers as well, managing to balance their weight and manoeuvre the branches in a way that they remain largely hidden from predators above but which gives them easy access to their food source. If they’re not in the fynbos you’ll find them munching the grass. We recommend: Their eyesight is not that good; give them plenty of warning that you’re moving into their space. They have been known to bite unsuspecting tourists. 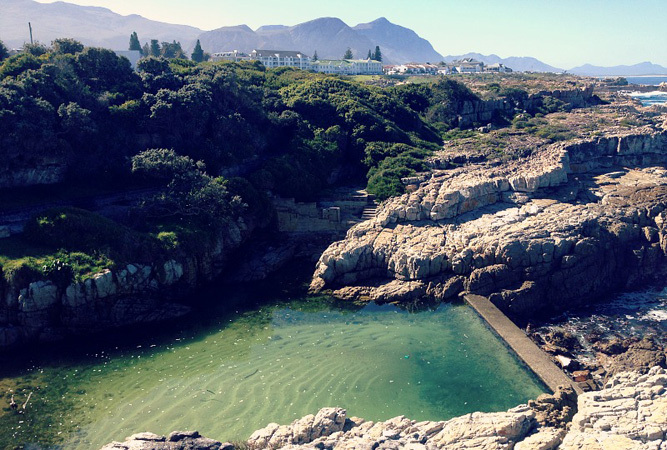 Not many people who visit Hermanus know about the tidal pool, Fick’s Pool. It’s out of the way and you need to head down a series of steps to reach it. Only those on the path, or those who frequent Hermanus, will know of its existence. It’s beautiful, safe and a fantastic spot to cool off. 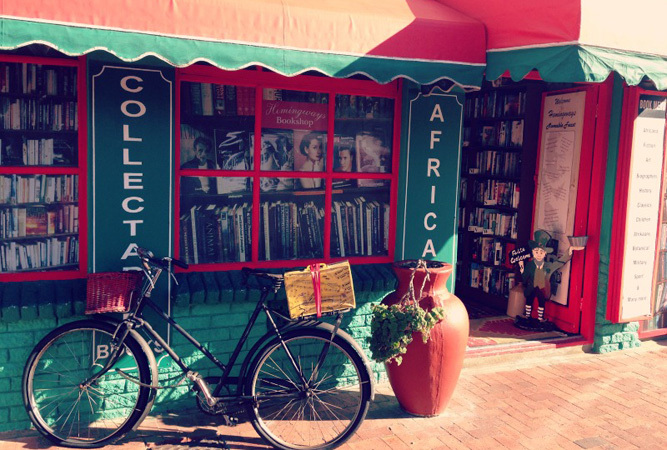 More popular, because its more accessible and obvious, is Frans Se Klip at the Old Harbour. The tidal pool here is more susceptible to weather and the tides, as one end is open to the sea. We recommend: Frans Se Klip is better for little ones. Fick’s Pool is good for older kids and adults out for a real swim. There are numerous good restaurants (most of them get a 3.2 average on Zomato) at the Old Harbour and Gearing’s Point, crowded around Village Square. One of them, The Pear Tree, is a classic little bistro serving what they describe as contemporary food with a sustainable and local emphasis. Interestingly, the name has nothing to do with either tree providing shade to patrons, but alludes instead to the name of the chef – Petri Hendriksz – whose first name devolved into ‘pear tree’ in the UK, where nobody could pronounce it correctly. We recommend: Their craft beers, the sliders – a trio of mini burgers – and the kingklip on lentil ragout; loved their choice of crockery. 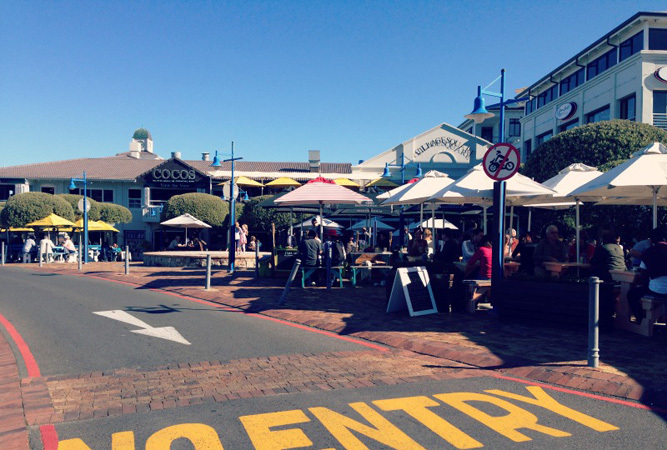 We also recommend these eateries: Just Pure Bistro, The Eatery, The Barefoot Cook, Fusion Café and Harbour Rock. This little coffee hub, in Market Square Street, is a find! They bake artisan breads, serve Deluxe Coffeeworks (REALLY good) and play French bistro-style music. The tapestries along one wall, the books, newspapers and magazines available for browsing, and the Where’s Wally books (Martin Handford) for kids make it a treat over and above the patisserie line-up. We recommend: The baked cheesecake and decaf cappucino! 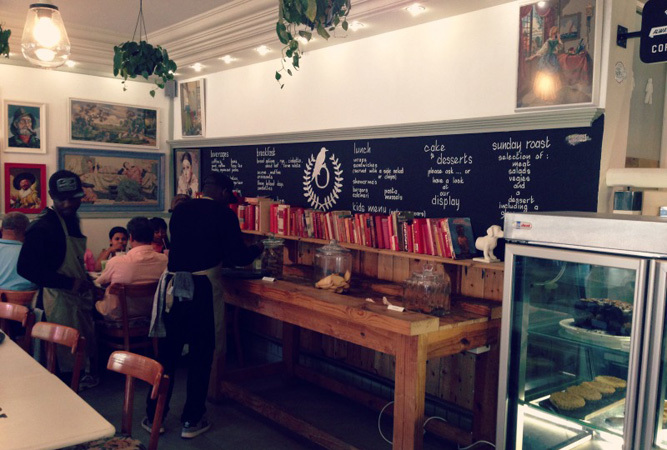 (they also open early, so great for breakfast if you get to Hermanus before anyone else). I cannot begin to describe this little gem of an antiquarian bookshop. Hemingways looks as though it stepped off the plane from England during the time of Dickens, and simply walked along the coast until it found its quaint position opposite the old fishermen’s cottages on Harbour Road. Its alcoves and vintage-filled recesses are laden with treasure troves from a bygone era. If the first editions don’t get you, the porcelain figurines, old typewriters, postcards and paintings most certainly will. We recommend: That you set aside at least an hour, because once inside, you’re not going to notice if the whales come into the bay…. Stick to the shoreline; the franchise-laden main road and plethora of concrete holiday apartments and hotels in Hermanus do little for the seaside village. If you do plan to overnight, book your accommodation here.